Twentieth century San Diego is a long way from Elizabethan London, but fans of the world’s greatest playwright can celebrate his 454th birthday at one of the few replicas of his famous theater. 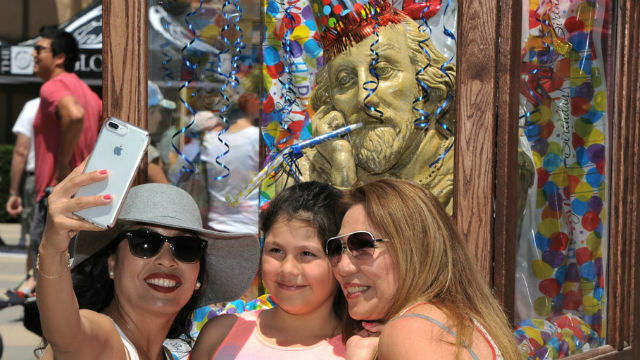 The Old Globe in Balboa Park is hosting a free, public birthday party for William Shakespeare from 10:30 a.m. to 2 p.m. on Saturday, April 21, with live music, “sonnet karaoke,” costume exhibits and birthday games. The “sonnet karaoke,” led by students in The Old Globe and University of San Diego Shiley Graduate Theatre Program, is designed to challenge the Shakespeare-savvy. You can bring your own sonnet or monologue—or choose one from the Globe. Period costumes are encouraged, and Globe Master Teaching Artist Lisel Gorell-Getz will show guests how to make perfect ruffles. The party is not just for adults. Children can create their own Shakespearean puppets, decorate cookies and have their faces painted.